Gypsy Scholar: John Milton, the Greatest Literary Figure? BUT, would Milton himself have shared our dismissiveness regarding literary evaluation, even ranking? Milton, who proclaimed that his epic would sing the better fortitude of patience and poetic martyrdom that previous epic had left unsung. Who early expresses his intent to soar above th'Aonian mount. Who dared to be known to think Spenser a better teacher than Scotus or Aquinas. 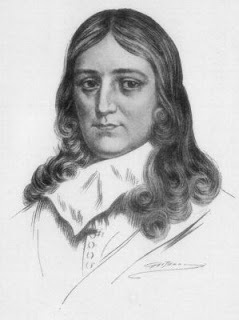 When we refuse Milton's invitation to rank his poem relative to others that have and might be written, do we miss something important about the epic? Do we refuse something Milton asks us to do? Perhaps some obscure writer is somewhere scribbling away in obscurity on the next greatest epic poem . . . though perhaps it will be merely the 'next-greatest'. I would like to add my insight into John Milton.........unfortunately, epic poetry is a little above my ability to comment intelligently. "I put my hat upon my head, and walked upon the strand. And as I walked, I met a man whose hat was in his hand." I leave this discussion to the experts. I think that the anonymous poet you quote was urging us to be individuals. Wear your hat, or carry it in your hand. Your choice. It's therefore about free will and thus was written from an Arminian perspective to counter the predestinarian views of Jean Calvin. It is thereby an epic little poem itself. A fascinating rending of a short rhyme, (Or is that rendering?). It's amazing what a poet can conceal in a simple verse. I am more of a realist. Such as the hillbilly who was drafted into the army. One day he came running to his sergeant, and said, "Sargent, I have to git back home, fer there's a fambly problem I need ter tend to!" Asked what was the problem, he said, "Ma writ me a letter, and sed she found my wife in bed with ArthrItis. Ive Heered of them Itis'es, and they say ole Arthr is the meanest one uv 'em." That ole Arthr had best hope ole Burse his wife don't find out about this or he'll be in a peck uh trouble. Though peck-uh trouble would sure 'nuff be fittin' for that ole boy.